Visual Studio no longer supports creation of MSIs directly. Need a third party tool. Visual Studio 2012 no longer supports Macros! Can I record/play Macros in Visual Studio 2012? You can search for work items in TFS. No longer need to install local help documentation. F1 will take your default browser to MSDN instead. Page Inspector - Trace both DOM, CSS and backing source code/files. Glimpse getglimpse.com - shows slightly more PageInspector. Suspend and Resume - "From the My Work page you can save and then restore not only your file changes and related work items, but also the position of your open windows, breakpoints, and other important cues." Concat - implicit cast. Null handling. Parse - Returns the result of the expression, translated to the requested data type. Exception handling - Where did the exception occur. "This method may return before is has finished". "Return from this method for now*, but resume it again when the following operation has completed"
The await keyword will ultimately strip off the asynchronous Task without blocking the calling thread. Exception handling - Centralized exception handling. Very similar to how the synchronous method would be written. Don't need a separate exception handler. await Task.WhenAll(downloads); //A task that becomes complete when all of the sub tasks are complete. - Split method into synchronous blocks. - Awaiter has a OnCompleted callback, GetResult(), and IsCompleted. Futures (Task) computations in progress who whose results will become available at some point. "defer the creation of a large or resource-intensive object or the execution of a resource-intensive task, particularly when such creation or execution might not occur during the lifetime of the program"
async and await allow you to write async/good programs that are as easy to write and to read as sync/bad ones. Spacing - 1/2 unit (10 pixels) between similar elements. - Wait 25 ms when arriving at the page before loading content. Displays initial page faster. "The details and design should focus on function rather than trying to emulate real-world analog versions of things, like the animation of a page turning in an e-book." Use Contracts to integrate with the rest of windows. You don't need your own independent settings or Search functions. Back Tracking on a RegEx and consume CPU time. Place time limits on execution. Consider segmenting the authentication system from the core database to protect against SQL injection exposing data. Types of tile template variation: Text only, images only or a combination. Use Toast Templates to inform the user of something important. The best toast notifications are personally relevant and time sensitive. Don't over use toast notifications. Each tile has a unique Channel URI. Requested by App on each run. URI can change. Typically expires every 30 days. Maybe purged sooner. Generated by WNS. Application Experience Review (AER) was used for early apps. Highly recommended to go through if you can. Expression Encoder for screen captures. Typically use 7+ for the age limit unless there is a reason to set it lower. Skeuomorphism - making things look like their real world counterpart. Using existing libraries will probably contain unnecessary compatibility code for other browsers. - Composer - send Get/Put requests to a URL Manually put in values. - Be disciplined with conventions and testing to avoid issues due to lack of typing system. Write defensive code for type checking. Windows Runtime C# classes must be sealed. Can't have generic classes in a public interface. Internal components can. Windows Runtime C# structs can only contain public fields, and nothing else. A C# class can't contain public fields. You can't create your own public exception classes, only use the predefined sealed type. You can't have ref parameters in a public method. These restrictions don't apply to pure .NET libraries. Only those targeting the Windows Runtime. Portable class library (.NET class library) that can be consumed by and .NET runtime and .NET in WinRT. .winmd files. MetaData files for the runtime. Can be opened by IL DASM. Catalog of all the classes used in an app are stored in the registry. Windows Runtime is built on COM. Language projections generally protect you from COM. Hence can't define own exception types as that is all the COM supports. As you move further from the screen it is harder to do content creation. Becomes more about consumption. - Can only show a limited amount of information. - "Gorilla Arm" - Sore arms after extended usage. - Lack of haptic feedback - no physical feedback. + Allows economy of movement - reduces fatigue..
Use device independent pixels to allow scaling. Gives independence from the device resolution. /Common/BindableBase.cs - CallerMemberName Attribute to implement INotifyPropertyChanged. Also CallerFilePath and CallerLineNumber. Typically the first thing to throw away from the default templates. ReSharper gives intellisense for StaticResources. SemanticZoomView - Give more information in the zoomed out view than just square tiles if possible. - If your grid is grouped then have semantic zoom. Currently only one level of zoom. Should continue to show the same information at the same level. In async void methods an unhandled exception gets put onto the default stack pool and causes the application to crash out rather than handle the exception. Anywhere there is an async void ensure you add exception handling as OnUnhandledException won't catch it. If the method returns Task<T> ensure there is an await in the call or any exceptions will be swallowed up. Code52 tool to reset highlight colour - HAMMER.Pants.exe Change cool in theme resources. Take generated file (Generic.xaml) and add to App Resources folder. Include it with the other Resource dictionaries (In App.xaml > ResourceDictionary.MergedDictionaries). Environment - Light or Dark color theme. 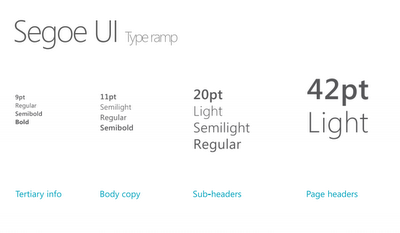 Consider using a proportional rather than fixed width font. 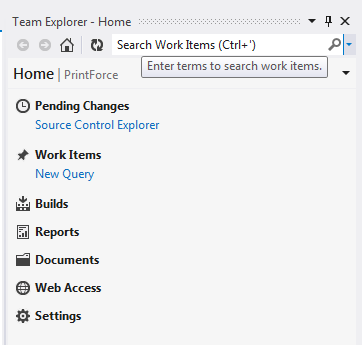 Solution Explorer now has a search box. Solution Navigator in Visual Studio 2010 productivity power tools is the earlier prototype. Visual Studio Test Explorer has adapters for running nunit and other testing frameworks. Option to automatically run tests after a build. Create a custom ruleset for code analsys and then save the .ruleset file at the root of the project. Create a separate build configuration that does a debug build and adds in the Code Analysis. WebAPI is designed to work across HTTP. New Framework to easily Send/Receive data over HTTP to a range of clients. Add packages for help and odata. Allows you to make a mobile web application and deploy it to the suitable store for the device. Also allows you to talk to the hardware. 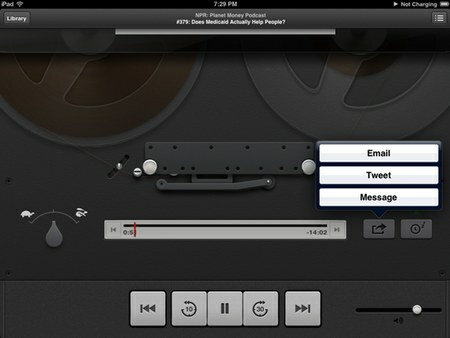 Camera, messaging, audio recording. A weakness is animation support. 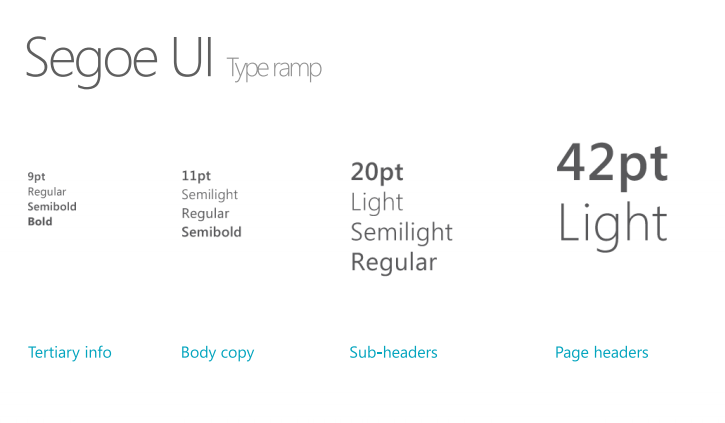 Especially when using PhoneGap on WP7. Still a Windows Phone App under the hood. Could easily create a hybrid application. www subfolder can be common with other phone platforms. Won't have support for touch events in WP7. Need to use click events, which are a bit slower. If your app is your product, write native for each device. Play To for streaming to TVs. Industry standard DLNA. Control for built-in camera control with pre-defined user workflow. Includes enrichment from bing maps. Light-aware apps. Adjust for Dark, Indoors, Outdoors. Contrast adjustment on Visual State. Tags are read/write. Not powered, no batteries. Windows.Devices.Enumeration - Device discover and notifications about devices. Windows RT devices don't expose low level bluetooh devices. Companion app - automatically installed when hardware is added. Use a lock - Standard Lock inserts appropriate barriers behind the scene. 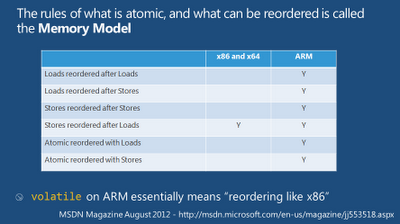 Memory Model x86 and x64 will only reorder "Stores reorders after Loads". 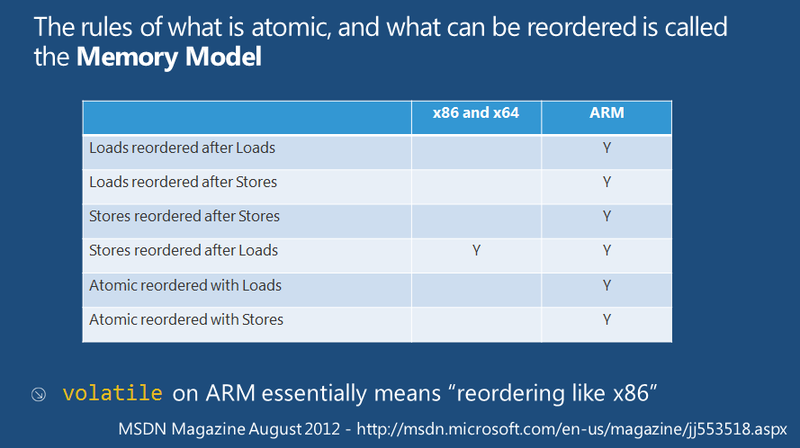 ARM processors may do significantly more reorderings. What threads can access what data? What threads exist and can I create more? Deadlocks are usually easy to solve with Memory dumps. Don't run arbitrary unknown code while holding locks. E.g. Don't fire a change notification within the lock. Create attributes that can make classes/members as threadsafe of on the UI thread. APP306:WP7 Silverlight DataBinding: How exactly do you do that? Nullable<T> now has .GetValueOrDefault(foo) as an alternative to ?? .TakeWhile discard all that match the condition. Stops as soon as the condition is false. Lazy - Allows for single instantiation and has support for thread safety. .MaxBy - Find the highest value. .ForEach() for enumerable in addition to the built in support for List. .Pipe() applies an action to each item as it passes through the sequence. Exception.AsEnumerable extension method creates a sequence from the root exception and the inner exceptions. AsStrings extension method to extract Data property key value pairs form exceptions. Includes checking for nulls. Every Exception in .NET has a Data property. Return - value or default.